Yes, I am aware that Halloween was almost two weeks ago and the squash season is quickly fading, but if like me, you can grab some last minute squash before it disappears until next year, go for it. I kept it seasonal and served this dish on all Hallow’s Eve – but you could even have it as a weekday meal. To amp up the spooky atmosphere and prove for an interesting table setting, I put the pasta in my very own pumpkin bowl, that I had spent hours carving out. This is a slightly unusual but nevertheless gorgeous dish, perfect for vegetarians; but fear not fellow meat-lovers – lower the cleavers! Fry a couple of sausages and add for a dish that will satisfy any pangs of meat withdrawals. A nice end to the spiced Pumpkin season! Okay, I’m not being completely honest with you. Like any other cook, I had to make do with what I had in my larder – so the pasta was actually plain ol’ noodles. But I actually find that when slathered and smothered in herbs and spices, this pasta (or noodles, rather) can become a rather exotic dish that gives winter a little kick. Although the recipe doesn’t call for it, I experimented by rubbing the pumpkin in a mixture of paprika and cinnamon to bring out the juices and give it a gorgeous wintry flavour, as well as chucking in a whole load of rosemary and oregano. A lot of clashing flavours that make for an interesting combination. Sliced and ready to scoop! a whole of lot of herbs and spices to add some flavour! 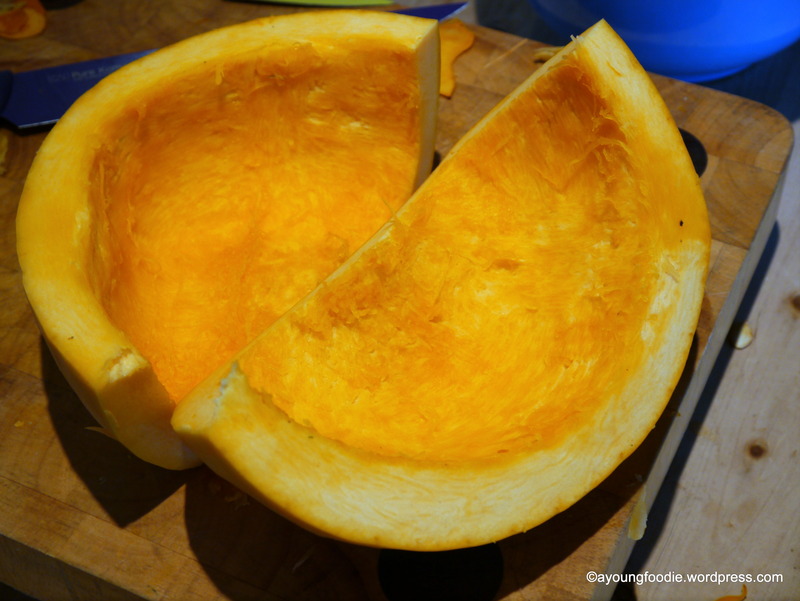 Tip the pumpkin into a large saucepan with a lid. Sprinkle over the sugar and a generous pinch of salt, then drizzle over 6 tablespoons of water. Cover the pan, place on a medium heat and steam the pumpkin, stirring every so often for 10-15 minutes, or until it is soft but still holds its shape. You may need add a spoonful or two of water during the cooking the pan seems dry. Set aside. 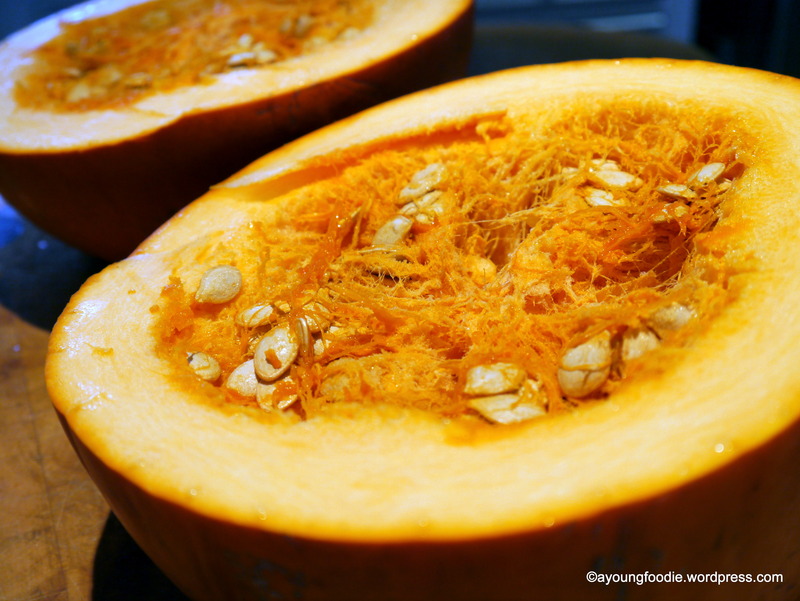 Alternatively, you could roast the pumpkin in the oven at around 180C until golden and soft. Don’t you just love the colours? foaming, then turn off the heat. Boil some water and cook your pasta/noodles. When cooked, scoop out a little of the cooking water, then drain and return the pasta to the pan. 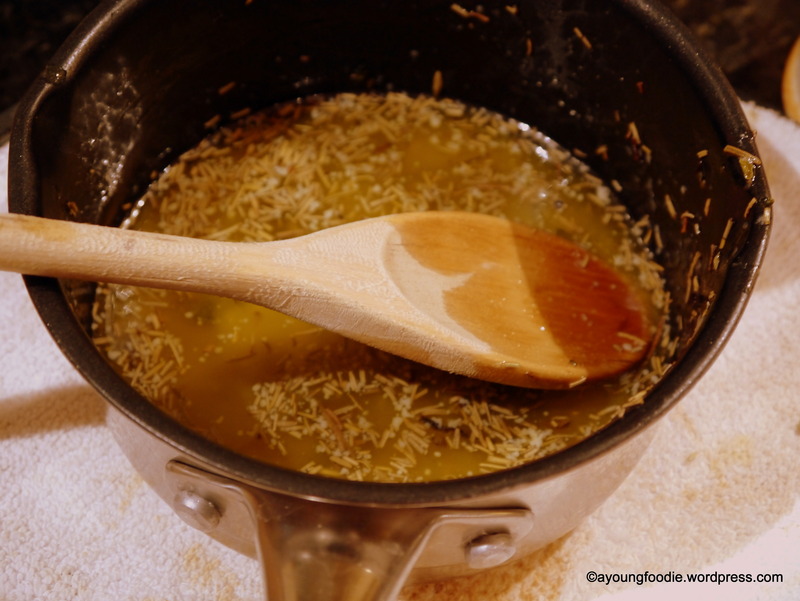 Put the herb butter over a high heat until sizzling, then pour in the lemon juice and let it splutter for a second. Tip the pumpkin, melted butter, 3-4 tbsp pasta water and half the parmesan in with the pasta and give it a really good stir. Season generously with salt and pepper and serve with the remaining parmesan to sprinkle over. Credits to BBC Good Food once again. Categories: Dinner, Halloween, Lunch | Tags: Baking, Cooking, dinner, Food, halloween, happy halloween, herbs, italian, Lunch, Meal, october, oregano, pasta, photography, pumpkin, rosemary, savoury, spaghetti, squash | Permalink. Wonderful! 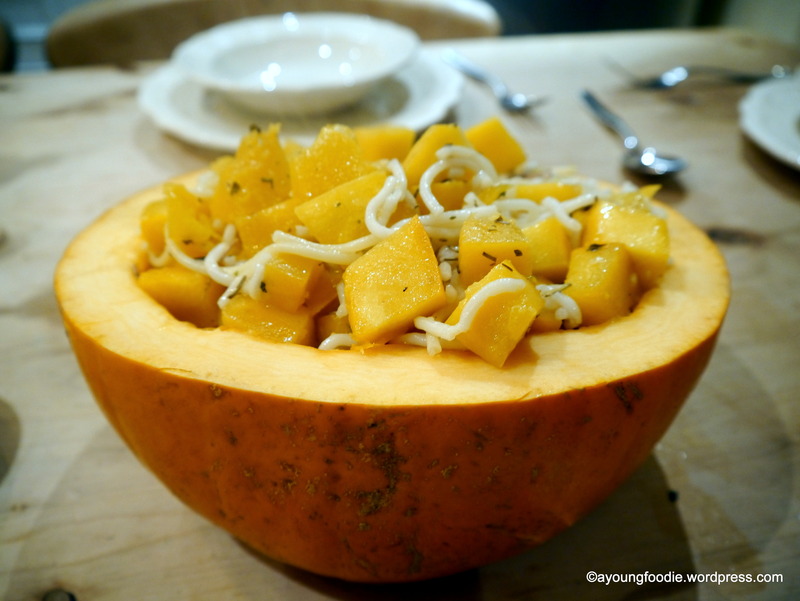 I love the idea of serving squash in squash bowl. Neato!!! !